8/10/2015Share this story on Facebook! 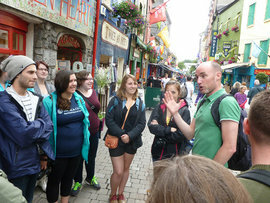 Students tour Shop Street in Galway, Ireland. "The Galway program allowed me to fully experience the arts through the lens of a new world." "Working alongside local professionals to pull together two amazing festivals is an opportunity I am so thankful for. The Galway program allowed me to immerse myself into a city and culture that values the artistic experience more than any other place I've ever had the pleasure of traveling." This summer, for the first time ever, Ithaca College sent 16 students across the Atlantic to the beautiful seaside city of Galway, Ireland, for two weeks of art festivals and cultural immersion. The students worked behind the scenes at the Galway Film Fleadh and Galway International Arts Festival, two of the biggest festivals on the Emerald Isle. When they weren’t busy attending craft workshops, film screenings, and music, dance, and theatrical performances, the participants toured the rustic Aran Islands or hung their heads over the Cliffs of Moher.